At only 5 years old, Ryan Anderson began experiencing abdominal pain and discomfort. His mother, Tara noticed he was constantly going to the bathroom. While not uncommon for a child Ryan’s age, Tara became increasingly concerned when large amounts of blood began appearing in his stool. Tara took Ryan directly to the family’s pediatrician, where initial testing failed to identify any underlying problems. Ryan was then referred to Children’s Hospital of Pittsburgh of UPMC where gastroenterologists ran a series of tests to determine why the bleeding persisted. Biopsies of his inflamed colon indicated that Ryan may have Crohn’s disease, a condition that involves chronic inflammation of the digestive tract. Following his diagnosis, Ryan returned to Children’s Hospital almost every month for treatment and care. In between treatments, Ryan enjoyed spending time in the hospital’s playrooms and taking part in the many activities planned by Children’s Child Life specialists. A sports fanatic, Ryan was thrilled to meet several of his Pittsburgh sports heroes from the Pirates and Steelers. To help relieve his symptoms, doctors placed Ryan on various medications. Unfortunately, the medications failed. As part of his ongoing evaluation, doctors repeated the biopsies of his colon to help determine further treatment. From these biopsies, Children’s gastroenterologists determined Ryan had ulcerative colitis and not Crohn’s disease. This finding meant that Ryan would need to endure surgery to remove his damaged colon and cure him of ulcerative colitis. Over the course of eleven months, Ryan underwent five surgeries. In November 2009, he endured his first surgery in which his colon was removed. Despite feeling a little weak following the procedure, Ryan bounced back very quickly. In January, Ryan experienced complications. A bowel obstruction brought him to Children’s Intensive Care Unit (ICU), where he endured emergency surgery to relieve the excruciating pain in his lower abdomen. When these complications persisted, specialists determined Ryan would need to undergo surgery, yet again, to clear another obstruction. Tara attributes the success of these procedures to the expertise of Dr. Cartland Burns, clinical director of Pediatric General and Thoracic Surgery. “Dr. Burns is so experienced. His knowledge and skills put us completely at ease,” says Tara. In July, Ryan underwent his fourth operation where surgeons created a “j-pouch” or internal reservoir formed of small intestine to assist with digestion in the absence of his colon. Weeks following surgery, x-rays revealed the pouch had healed. On September 23, 2010, Ryan endured his final surgery to reconnect his bowel. In total, Ryan spent more than 100 days at Children’s. “The nurses really helped guide us through the entire process. When things got tough, they gave us that nudge we needed to continue on,” remembers Tara. 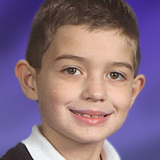 Now 7 years old, Ryan has enjoyed returning to school. After participating in the third annual DVE Rocks for Children’s radiothon held in the hospital’s Eat’n Park atrium, Ryan is quick to tell his first grade class about his on-air appearance. “He likes to think he’s famous,” laughs Tara. When I was reading this it hit really close to home. Last december my 10 year old son cme to me saying that his “poop was red”. Well not seeing it, ( he had already flushed), I asked all the normal questions. About consistancy, if he was felling any pain, sickness, ect. Nothing else out of the ordinary, just the color. I assumed something he ate. He went to his fathers that friday. It wasn’t until the next tuesday that he came home from school early. Throwing up, pale, and very weak and tired. His father called the doctor and they made him an appointment. When they took a blood test his white blood clount came back ok. His red blood count came back a 6. It’s supposed to be reading at a 12-13. He was bleeding internally. We rushed him to Childrens Hosp. in Pittsburg and they almost immedialty gave him a blood transfusion. Waiting for the test reasults from that and knowing that should bring it back up to at least a 10 was bitter sweat. Well, The ext blood test was still reading a 6. Then you hear the doctor telling you that his origianl reading was probley thown off from being dehydrated and was probley more at a 3-5 was horrific. Anyone that knows anything about blood levels knows that anything below a 5 is death. It came to be that after 3 days of tests and transfusions, they found he had Meckel’s Diverticulum. He had to under go surgery and once we knew what it was, it helped a little, because the doctor could explain more. But I have never delt with a Hospital more in tuned and more caring for their patients ad the families than Childrens. They are amazing. Can not say enough. He came through the surgery with flying colors and the surgery team was also amazing and so caring. an never say enough, I love those guys.